1. 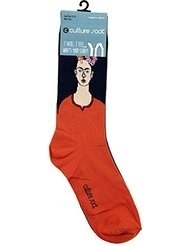 Socks that say "Yes, I want fries — AND a shake." Get this pair from Shop BuzzFeed for $12. 2. Socks that make Shark Week every week. Get this pair from Forever 21 $6. 3. Socks that provide the perfect Monday morning accessory. Get this pair from Nylon Shop for $12. 4. Einstein socks that are "relatively" cool. That's a science joke. Please tell me you get it. Get this pair from The Sock Drawer for $12. 5. Socks that show pugs riding unicorns, as they often do. Aren't these so puggin' cute?! Get this pair from Asos for $4.84. 6. 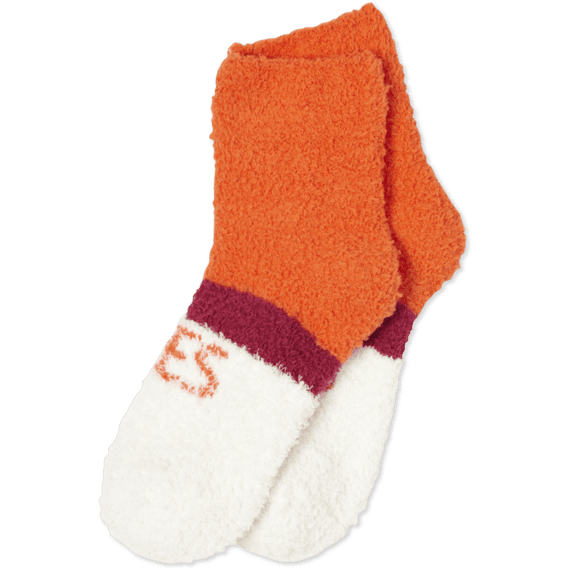 Slipper socks that are lined with faux fur for maximum warmness. Get this pair from Asos for $12.90. 7. Socks that understand how you feel 24/7. Please look at that passive aggressive smile. Get this pair from Forever21 for $1.90. 8. Polka dot ankle socks with a hint of lace...because why not? Get this pair from Asos for $6.45. 9. Pretzel socks that also have (very hot) dogs on them. Get this pair from American Eagle for $5.97. 10. Socks that will "Slyther-in" to your shopping cart. I'm sorry but I couldn't resist the pun. Get this pair from ThinkGeek for $9.99. 11. Motivational socks that say "You can do it!" Get this pair from Amazon for $9.95. 12. Slouchy tie-dye socks that basically say "tubular." Get this pair from Urban Outfitters for $18. 13. 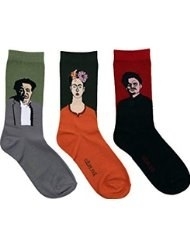 Socks that show off your handsome one true love. Get this pair from Forever21 for $2.90. 14. Socks that show anything is possible if you just believe. I guess pigs do fly. Get this pair from Amazon for $8.61. 15. Minion socks because, you know, you're one in a minion. Get this pair from Amazon for $6.70. 16. Colorblock socks that scream, "I'm cozy! Buy me!" Get this pair from American Eagle for $5.37. 17. Socks that have both glitter *and* unicorns. SOLD to every reader who sees these. Get this pair from Topshop for $6. 18. Socks that depict a pug wearing a bow. Get this pair from Topshop for $12. 19. Sailor Moon socks that help you save the world from forces of evil. Get this pack from ThinkGeek for $19.99. 20. Over-the-knee socks that are basically pants, right? Get this pair from Urban Outfitters for $16. 21. Ankle socks that show your response to a story you weren't paying attention to. 22. Fuzzy socks with a good life motto. Get this pair from Life is Good for $10. 23. Socks for every makeup addict out there. 24. Socks that are perfect for people with smelly feet. These scented bad boys smell like cupcakes. Get this pair from Little MissMatched for $9.33. 25. Socks that prevent water from getting into your boots on rainy days. Get this pair from Nordstrom Rack for $24.97. 26. 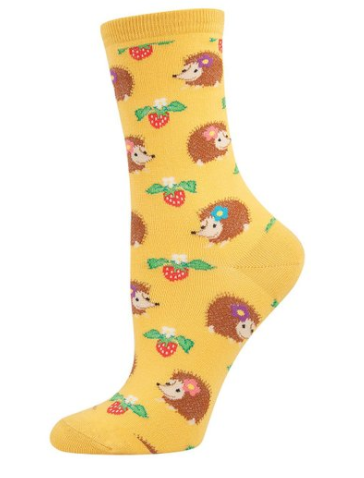 Hedgehog socks that will make you say "Awwwww." Get them from Amazon for $11.68. Get this set from Amazon for $16.95. 28. 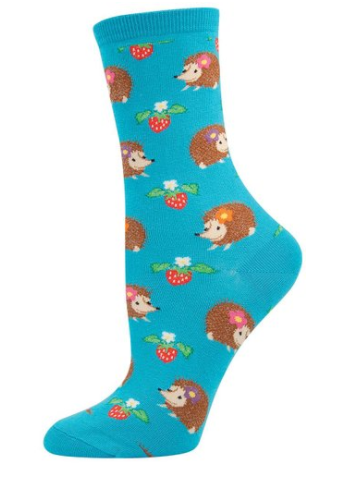 Sheer socks that are not as ~prickly~ as they seem. 29. 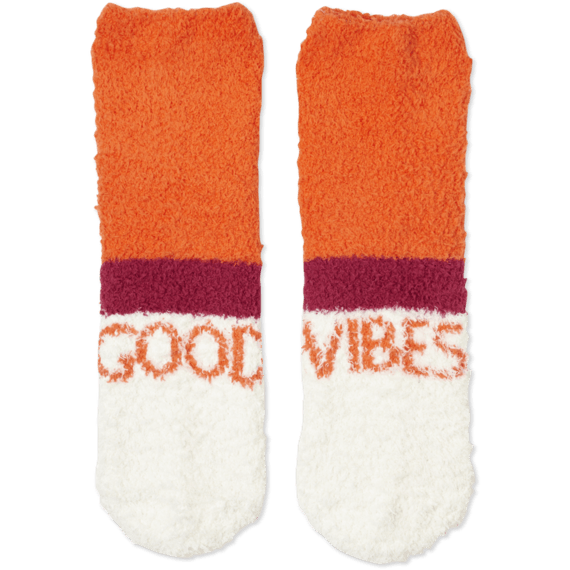 Fuzzy socks that will make you wanna catch 'em (or buy 'em) all. Get this pair from Amazon for $8.75. 30. Socks that urge you to take a chill pill. 31. Socks that ensure 10 points for Gryffindor! Get this pair from Amazon for $10.87.